Akeshov, Angbyplan, Islandstorget. 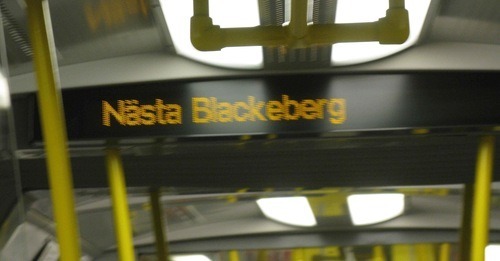 The passing of each stop on Stockholm’s metro brings me closer to Blackeberg (pronounced “Blahkehbarei” by the Swedish public announcer with the harmonious voice), the infamous Stockholm suburb where the 2008 film LET THE RIGHT ONE IN took place. Directed by Tomas Alfredson and based on the novel by John Lindqvist, the film was about an eccentric and lonely boy who falls in love with a young vampire girl who convinces him to take revenge against the bullies who torment him. The Swedish revisionist horror film is what Anders Wotzke of Moviedex described relative to Twilight as “the vampire film for everyone else” and features a simple colour palette, stoic relationships between characters that echo the dark Swedish winter, and an engaging plot. It’s one of my favourite films of all time. 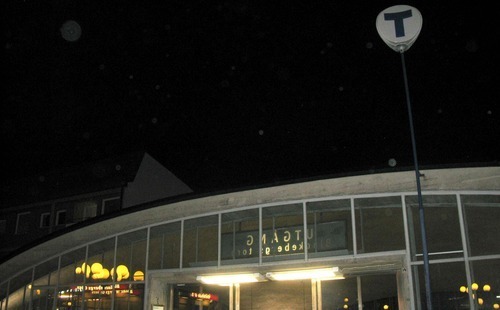 While most of the film was actually shot in another Swedish town, two key scenes were filmed in the vicinity of the Blackeberg train station. I stood in the middle of the location of the opening snow-filled shot and the exact place where the vampire girl jumped off a building to bite an unsuspecting drunk woman. I vividly imagined the film’s actions and milieu recreated around me. Having identified with the emotions each scene implied, I felt as if I was momentarily a part of the story. Of course, no one has ever actually been bit by a vampire and the street lights only brilliantly hit the snow for the few seconds the cameras rolled to get that shot. These were fictional events. About a week later I found myself at Sachsenhausen, a Concentration Camp where between 1936 and 1945 about 30,000 prisoners of war, Jews, Communists, Homosexuals, Gypsies, and other social deviants died at the hands of the Nazi regime. This actually happened. Yet as I walked around the stone and metal monuments marking each of the barracks, I identified, even as a person of Jewish origin myself, no closer with the space than would an outsider or common tourist. I simply could not imagine the real horrors that took place. Something significant happened in both spaces. But why could I more easily understand the fictional events? We put meaning into the spaces we visit. These places become sacred and their meanings reflect our personal internal logic. All these perceptions and understandings of space originate from our socialization, values, priorities, and influences, and interests. I am interested in film more than World War Two. Therefore I feel I understand the meaning of Blackeberg as defined by LET THE RIGHT ONE IN more than I understand Sachsenhausen as defined by its museum and memorial. What film locations would you like to visit, or have visited? People want to find new ways to immerse themselves in the emotional experience they enjoyed from watching a certain film and film tourism, or visiting places where certain movies were filmed, can fulfill that desire. Which film locations have you visited? Upon finding the location, what emotions did you feel? Did the visit live up to your expectations? Which film locations do you want to eventually visit? It’s one of my favorite movies ever. I stood amidst the area of the opening snow-filled shot and the definite place where the vampire young lady bounced off a building to nibble a clueless tipsy lady. Having related to the feelings every scene intimated, I felt as though I was almost instantly a part of the story. Love it. This entry was posted on 2013: August 4 by adambentley in Uncategorized and tagged let the right one in, sacred space, stockholm, sweden, yegfilm.